To bring a little bit of Provence to your table, we suggest the following quick and easy sauteed tomatoes à la Provençale recipe. 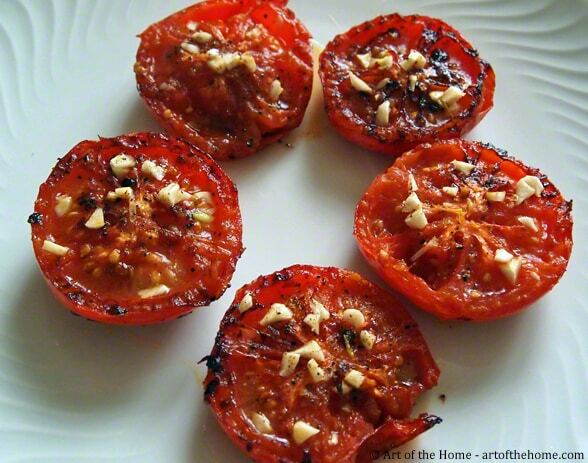 Art of the Home sauteed tomatoes à la Provençale is a very versatile and healthy side dish. Tomatoes à la Provençale can be served with either meat or fish. They are also great companions to enjoy with kebab or ribs during a summer barbecue. Our tomatoes à la Provençale recipe is so “facile” (easy) and does not require you to turn on the oven — always a plus on hot summer days.And as long as you have tomatoes handy, not much planning is required for this side dish since Art of the Home quick and easy sauteed tomatoes à la Provençale recipe only uses a few staples already in your kitchen. Check our detailed easy recipe and Art of the Home suggestions below. Enjoy and bon appétit! Wash tomatoes and cut them in half lengthwise. Place them in a frying pan (without fat), flat part facing down and start cooking under low-medium heat (about 5 minutes). 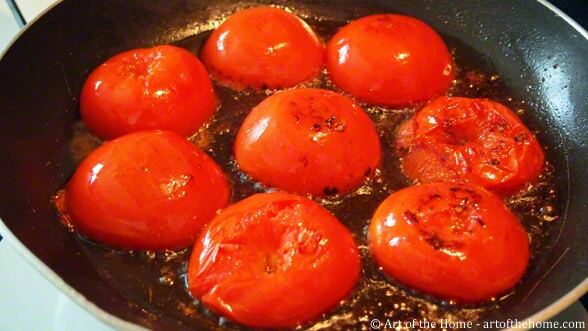 Add 3 Tbsp of olive oil and keep cooking under low-medium heat until the tomatoes start to brown. Carefully turn tomatoes over. Add salt & pepper and chopped garlic on top of each tomatoes. Add a few drops of olive oil as needed. Cover with aluminum foil (this will make your tomatoes even more tender) and slow cook for another 20-30 minutes or until the tomato flesh has softened. Make-ahead: tomatoes à la Provençale can be made ahead and warmed up before serving. Spices: for additional Mediterranean flavor, you can add a few pinches of Couscous spice.